Rioting broke out in central Belfast on Friday evening, with loyalists forced off the city's main thoroughfare as they sought to prevent a parade of 5,000 republican dissidents and their supporters marking the anniversary of internment without trial. The loyalists were physically pushed off Royal Avenue by riot police, who were then bombarded with bricks, bottles, stones and fireworks. The police, who deployed dozens of vehicles, with most officers wearing riot gear, responded with water cannon. Police were also using dogs to control the crowds. At least two police officers in body armour were knocked to the ground during the disorder. 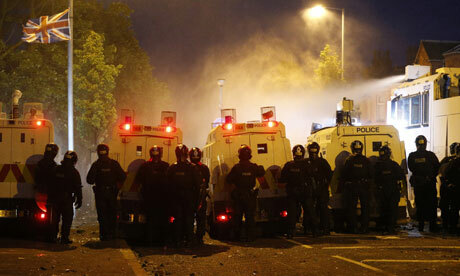 The Police Service of Northern Ireland (PSNI) confirmed it had fired plastic baton rounds at the rioting loyalists. Shortly after 7pm the PSNI used riot squad officers and armoured vehicles to block the dissident republican parade at North Queen Street in the nationalist New Lodge district. It meant there were two separate stand-offs around central Belfast, one involving the loyalists and one involving the republican dissidents. The focus of the trouble involving up to 1,000 loyalists was centred on the junction of Royal Avenue and North Street, which leads to the loyalist Shankill Road. The violence erupted after the loyalists managed to block Royal Avenue around 6pm. The loyalists are objecting to a republican dissidents commemorating the 42nd anniversary of internment. An alliance of hardline republican groups opposed to the peace process brought thousands on to the streets in the first ever dissident parade to go through Belfast city centre. 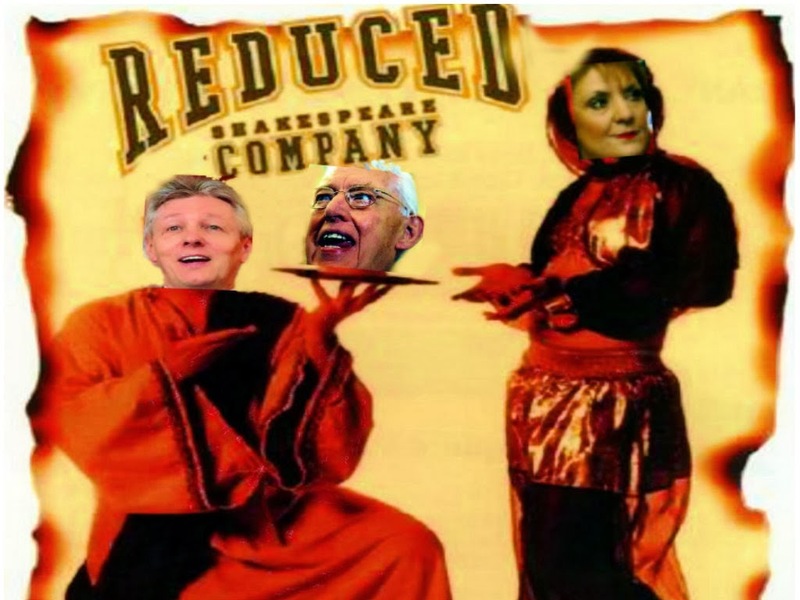 They included the 32 County Sovereignty Committee, the political wing of the New IRA. The Parades Commission appeared to have been hoodwinked into believing legal protests were planned when it permitted a number of previously unknown groups to mass along the parade route.Two so-called ‘residents groups’ were granted permission to stage a protest involving an estimated 300 people at Royal Avenue, where the worst of the violence broke out. 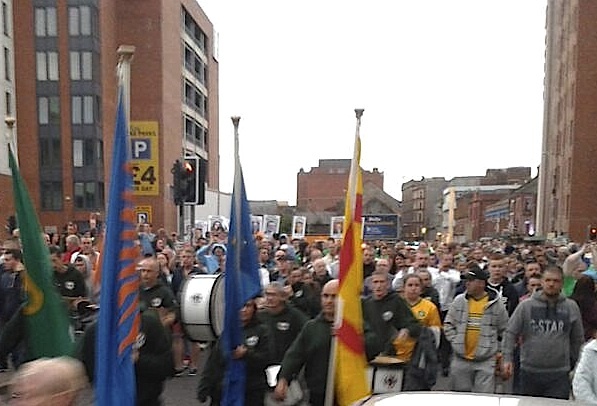 A further four protests were held by other Protestant organisations including the Orange Order, adding a further six hundred loyalists into the mix. Business premises were attacked and bins were set alight amid the disturbances. However, the riots only served to draw attention to a hugely successful parade and the incoherent rage of loyalism.While the original, neutral city centre route through Royal Avenue was blocked off, marchers were ironically directed by the PSNI through the intersection of Peter’s Hill and Carrick Hill, passing an interface with the loyalist Shankil Road. The parade was briefly attacked at the intersection where a burning barricade had been erected. However, it ultimately made it down Millfield to a rendezvous with thousands more cheering supporters in the Divis area of west Belfast.Organisers successfully appealed for calm from marchers. Amid a lull in the trouble, civil rights activist Dee Fennell said the media had wrongly portrayed the parade.